Chicago’s Field Museum aims to “fuel a journey of discovery across time to enable solutions for a brighter future rich in nature and culture.” But how do we do that? Join us for a conversation about how an organization (in this case, a natural history museum) can work with communities to advance on-the-ground conservation efforts and improve quality of life. The Field Museum has worked for over 13 years at Beaubien Woods with the Forest Preserves of Cook County, the landowner of this 135-acre site surrounded by an urban matrix of landfills, neighborhoods, the Little Calumet River, and industry. Beaubien is one of only a handful of district-owned properties in the City of Chicago. We’ll share lessons learned from our interdisciplinary social science and ecological science approach. And we’ll identify best practices for building partnerships and cultivating stewardship of natural areas. Lorena is the Community Engagement Specialist in the Keller Science Action Center at the Field Museum, Chicago, IL. 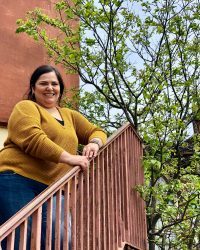 Lorena comes with years of community organizing experience in Chicago, first with the Little Village Environmental Justice Organization and then with Faith In Place. Whether collaborating to create culturally-based environmental programming, or working with community members to strengthen connections with nature, Lorena works to build capacity and improve quality of life.